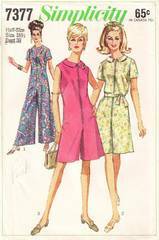 Vintage Simplicity sewing pattern 7377. Pantdress, in regular or ankle length, has front zipper and slightly lowered round neckline. Can be made in short sleeve or sleeveless version. Optional collar and self fabric belt. Misses Size 18.5; Bust 39; Waist 33; Hip 43. Cut and complete. Envelope and contents are in very good condition.